1. Performance- The products MUST perform, no questions asked. It's very important to me that the products shut down the myth of cleaner cosmetics not being as effective as the conventional brands. 2. The packaging MUST be aesthetically appealing and functional at the same time. I'm a bit hesitate when a product is good but the packaging doesn't make sense. 3. The color selection is wide enough to accommodate everyone, all skin types and tones. When I reached out to Elate Cosmetics from hearing about and seeing them on Instagram from Clean Beauty influencers, I kind of already knew what I was getting into. However, I am also a stickler for amazing customer service from the get go so I was immediately impressed by the follow up of Jessica, their wholesale contact person. She was super helpful and extremely accommodating. The package arrived and after unpacking everything, including my first capsule palette, I was hooked. I remember saying to myself after I tried the Full Tint foundation sample, I'm IN! This brand is coming to Trellis Beauty. At Elate Cosmetics, our mission is to care for each other, our communities, and our world. Through healthy ingredients, sustainable practices, and wellness minded goals, we strive to build confidence through kindness, and allow you to create your own standard of beauty. We value spirit, kindness, wellness, community, and authenticity. Meet Melodie, Founder of Elate. I am super excited to be the first retailer here in North Carolina to carry Elate and am confident that you will fall in love with the brand as much as I have. 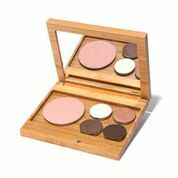 You will be able to customize your own palettes with the choice of the capsule, medium pro, or large pro palette. Along with the eye and cheek categories, we will have both complexion products, Fresh Tint and Full Tint. The newest color collection, The Flow Collection will be available to shop online as well! New brow balms, two NEW fall lipstick shades topped off with a brand NEW lipgloss color.